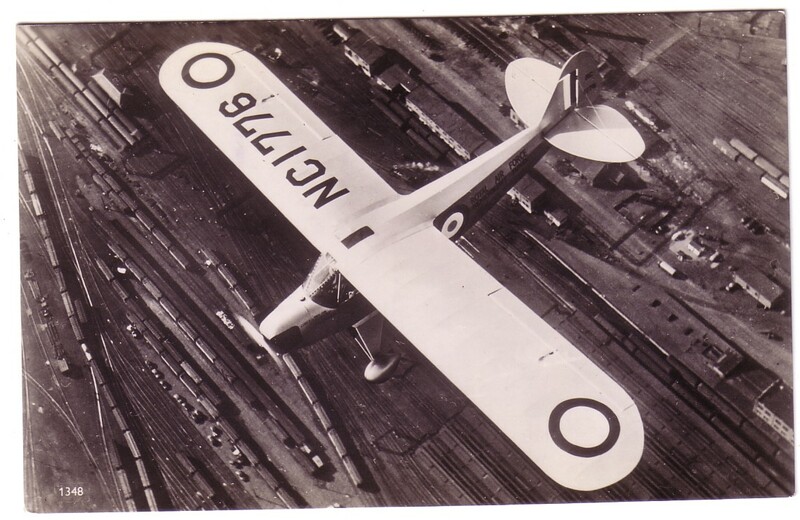 The subject is a US registered Piper J3 Cub but with RAF markings, shown over a rail marshalling yard somewhere in North America. Just visible on the side is the text Royal Air Force followed by two words, one long and one short. My best guess was “Development Flight” assuming that this Cub was under evaluation, sometime 1939-41. The facts are actually more interesting – some Web research came up with the following. Firstly this Cub still exists and has been repainted in these colours in the North Carolina Air Museum Asheboro NC. It was originally donated by Bill Piper, founder of the company to be raffled in aid of the RAF Benevolent Fund, which is what the side lettering actually says. Not only that but Piper dealers throughout the US were encouraged to donate further examples so eventually a squadron of 49 Cubs was assembled, one per state plus NC1776. They were collectively known as the “Flitfire Cubs”. The full set was displayed at New York, La Guardia in April 1941, all in the colours as shown and all but NC1776 named for a State. Originally won by a New Yorker, Jack Kindler, NC1776 was used on the civilian flight training program during WW2 and was at flown by Orville Wright in 1943.